Re: Best Unlimited NBN Plans? FFTN is what the average householder is likely to be on, I know that is all is available to me. Personally I'm outraged that the Liberal Government has NOT given us the users the choice to either stay on ADSL or switch to NBN. 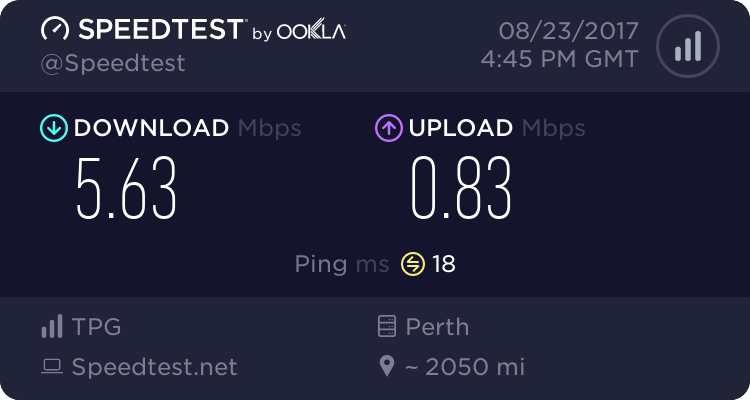 I for one am happy on ADSL, I don't get superfast speeds (average download is 5mbps) BUT who is to say that when I'm forced to switch to NBN my speeds will not get slower? Then there's if a power outage happens you not only lose your internet but your access to our landline too! Thanks for that link, very informative. First, it was NBN that installed the Node several hundred metres from my house. So I get FTTN. My chosen service provider had no part in this decision. Morrow the says " all network carriers design their networks with portions that have multiple end-users sharing the bandwidth or amount of data that could be sent at a given time. This is commonly defined as the contended part of the network"
Since NBN presumably own the cable to my Node (from the old telstra exchange?) and it is old telstra copper from the node to my house, as offered by NBN, the contended part of the network is presumably from the exchange to the NBN POI. So why did NBN do the first part, the last part, and not the middle part? deliberately setting ISP's up for the "contended" part.? Its not called contended for nothing. Were they set up for the blame game that follows? Secondly, Morrow makes it sound like the CVC was an inevitable technical decision, and not a commercial decision open for discussion/negotiation with the collective retailers/government/user groups. Seems to me NBN has been told by governement to recover the investment ASAP and hang the rest (retailers and users alike). As in hang them out to dry with high fees for low bandwidth. The original intent was to amortise the investment over 20 years, not get it back in five. The public money invested surely should be structured like a mates rates loan to the users (the public) and not a commercial one, else why do NBN by governement rather than private means anyway? It is my view, the government should have collected a levy from the telcoes, and reinvested it back in the industry to pay for less profitable regions. If a telco takes on an unprofitable region, they get that levy back. Combined with a bit of regulation around interoperability and a mandate on fibre, and small government contributions to the levy, the NBN would have been privately done in five years. The mere existence of the CVC sets retailers up for a race to the bottom; in many regards they have now been given no choice, because restricting user bandwidth is their only poiint of competition. Less CVC + more users = lower charges is the ONLY formula reatailers have left to compete on the NBN network. I begin to understand now why Telstra has kept out of this game with high charges, no negotiation. The reatilers good and bad alike are on a hiding to nothing with the NBN cost structure. Another typical Liberal Government screw up on our precious need for High Speed Internet to connect our great land of Australia. I hope they can't sleep at night, knowing how badly they have screwed up a great plan by Labour for next Gen Internet by creating these cost blow outs and crippling Australias Tech Future to another, more innovative and visionary Neighbouring Country. I am wondering if things have improved for you with your FTTN connection? Do you think with the lowering of the CVC charge, that your ISP will take advantage of it?